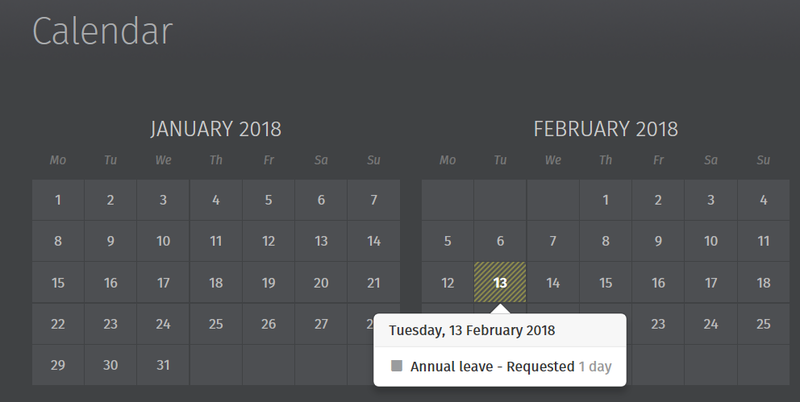 1) Select 'Request Leave', either on your dashboard or when accessing the full calendar. 2) Select the Date, Type of Leave, and whether the leave is for a full day or half day. Enter any additional information regarding the leave, if required. 3) Click 'Submit Request' or click 'Add Day' to add further leave days. Your requested days will now be marked on your calendar as pending, and your employer will receive a notification with the details of your request for approval. If your leave request is approved by your employer, you will receive email notification confirming this. Your calendar will be updated accordingly to show the approval. Should your leave be rejected, you will receive email notification confirming this. You should contact your employer directly if you need further details.